Sandwiched between the East and West, Russian intellectuals have for centuries been divided geographically, politically, and culturally into two distinct groups: the Slavophiles, who rejected Western-style democracy, preferring a more holistic and abstract vision, and the more rational and scientific-minded Westernizers. These two ideologies cut across the political spectrum of late nineteenth-century Russia and competed for dominance in the country's intellectual life. The tension created between these two opposing groups caused the feeling that violent upheaval was Russia's future. In turn, many began to think that Russia was possibly following the path of France and that a French-style revolution might be possible on Russian soil. In The French Revolution in Russian Intellectual Life, Dmitry Shlapentokh describes the role that the French democratic revolution played in Russia's intellectual development by the end of the nineteenth century. The revolutionary upheaval in Russia at the beginning of twentieth century and the continuous expansion of the West convinced most Russian intellectuals that the French Revolution in its democratic reading was indeed the pathway of history. 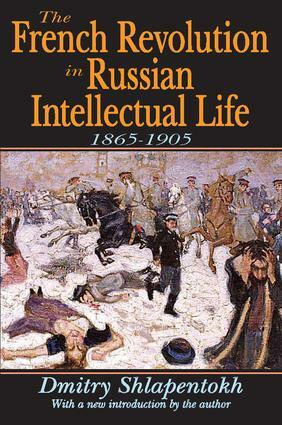 Yet the rise of totalitarian regimes and their expansion proved the validity of the sober vision of nineteenth-century Russian intellectuals. Some conservative Russian intellectuals believed that not only would Russia preserve its authoritarian regime but it would spread this regime all over the world. In this context, Shlapentokh argues the French Revolution with its democratic tradition was only a phenomenon of Western civilization and hence transitory.